CH Warbonnet's As You Wish "Wesley" Whelped: 11/25/06. 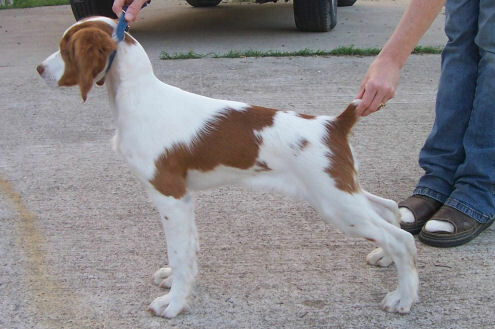 By Int'l BIS, Am BISS Multi-Group Placing Am/Int'l CH RJ's The Divine Comedy, CGC x CH Wyngold Wyndy Warbonnet, JH. Bred by us (Todd & Jan Breitenfeldt) out of Wyndy and Dante. Wes is a happy, typey, friendly dog who is always watching the people around him. He is always using his nose and loves to show off in the show ring! Wes resides at Tania's house in Texas. Wes is now a show Champion. He earned one major in TX with Tania handling and two majors in ID with Sari handling. He finished in Sept. 2009 at the Helena, MT shows with Sari handling. 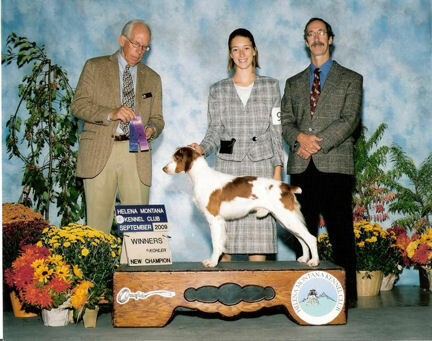 His sister Chloe (see Capello Kennels below) was Central Futurity Dual Dog of the Year, 2008. Wesley's Puppy Photos (pup name: Clove). He is now owned by Bob from Billings. Wes as a new show champion. Fall, 2009.